This 1985 Siemens cell phone came of age when cell phones were so rare and costly that they were, to some, considered showy. So Siemens handily built this suitcase in which that massive battery pack could hide. The more demure Gordon Gekkos of the world could rest assured knowing that people would likely presume that the suitcase they were carrying when seen emerging from their Rolls was actually storing documents. 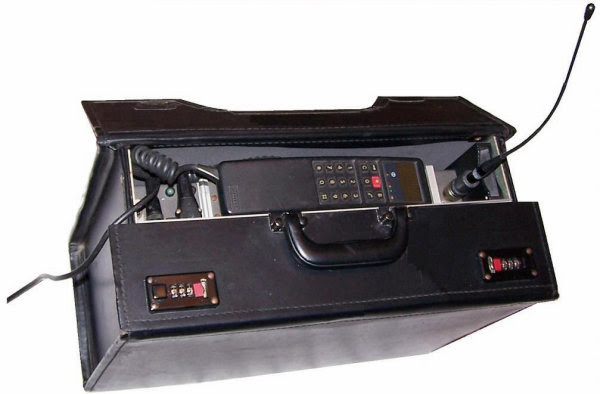 Back in the day of the humble suitcase cell phone, roughly 12 million people in the world had cell phones. Today, it's 6 billion, or 87% of the entire global population. We can all see that the cell phone has certainly done its disruption. Imagine this: One-third of Kenyans use a cell phone banking system to send over $8 million in text payments daily. (Cell phones are, after all, still far more affordable than personal computers.) Annually, this accounts for 15% of Kenya's GDP flowing exclusively through cell phones. If a similar system were operating in the U.S., it would generate person-to-person cash flows of $2 trillion annually, and $9 trillion globally. Makes one think: Have we even begun to see the full extent of the cell phone's power to disrupt the entire global economy? And then what of the Internet, which is still just getting globally democratized? Has its disruptive power even really begun to manifest? Trying to imagine where the digital age could take us can kind of makes our heads feel like they're about to explode. Perhaps it's easier to ponder if we're on the cusp of an unprecedented quantum leap made possible by the digital age - the effects of which have only just begun to reveal themselves, but might soon take off at...one trillion bits per second. Please see below for this month's section on innovation, the head spinning pace of change in the digital age, and what it all might mean. The pace of change today really kind of boggles the mind, especially for my generation. When I was a young child, my family got a television, a wowsville bulky black and white set where you had to get off the couch to change channels between the three networks. Then when I was an adolescent, we landed a man on the moon. More wowsville. During my teens and early twenties, we got disco...Ha ha ha, does that count as innovation? I suppose the 100% polyester suits do. The pace of change gained more momentum in the 1980s with the fax machine, and then the PC and cell phone. Then in the 1990s, when the PC and the cell phone got democratized and Internet came on the scene, the pace of change seemed to take off at lighting speed. For us Baby Boomers, change has been constant. The constant, really, in today's confusing and tumultuous global economy. Change is the one thing we can predict: It's going to keep coming and it's going to keep coming on fast. In just a decade, the marvelous Yahoo was quickly supplanted by the mighty Google. And now it seems Apple is about to gobble up the whole world. Social media has shrunk the six degrees of separation down to four. Facebook and Twitter are spawning and perpetuating revolutions in the Arab World. At no time in human history has almost everyone on the planet had instantaneous access to virtually all the information ever created in the history of humanity. Now there is a wowsville statement for sure. And it's true. More importantly, it is dramatically transformational. You...we...are living in the middle of a truly remarkable period in time, one that will be taught in schools about a turning point for mankind. But, no change comes without risk. The more interconnected we are, the more interdependent we become. And disease spreads fast in close quarters. So now we all must depend on the rest of the world to do their share to keep the system intact, to keep the game going. Hmm...can we depend on our global cousins to take the high road, to do the right stuff, to make the sacrifices when needed to keep us all in the chips? Can we even depend on ourselves to do so? We shall see. But odds appear high that at some point there will be further economic challenges. The more complex a system gets, the more systemic risk builds. Keep it simple stupid just doesn't seem all that possible in today's world. As capital flows, so go jobs. And Helicopter Ben has made sure there is ample capital around. Uncle Ben seems committed to the theory that printing money is the way to spur economic and job "growth." Over the last three months, job numbers have turned a few heads and made a few smiles. But then again, who can remember the last time bathing beauties in bikinis showed up on Chicago's Lake Michigan beach in March? What a winter, eh? Or should we ask, what winter? There was virtually no winter in the United States this year. Snow? We had only enough in the Rockies to keep the skiers and ski resorts just modestly happy. Ice? Didn't see any stories about that this winter. It seems we were blessed with a long fall and now early spring. Given the amazingly mild weather, we should have naturally seen good economic and jobs numbers. Fewer construction projects were put on hold. More people could drive to the mall. They probably drilled more oil & gas wells in North Dakota this year than any year in history. The job market has benefitted greatly from Mr. Bernanke's printing press, Washington's great fiscal profligacy, and now the weather. We shall see if it can continue. Behind all this stimulus is a reasonably improving job market, with job creation growing and unemployment declining. In our little market, hiring remains decent. Stimulus has kept the corporate finance and investing game clipping away. At some point, though, we must return to an economy where value is created by making stuff, not by pushing paper and punching keyboards. If you want to build a long-term sustainable career today, look to the world of making stuff. The more complicated any system gets, the more systemic risk builds. This should seem obvious. If anything can be taken from the 2008 crash, this is it. Yet our too-big-to-fail financial institutions are now even bigger. Hmm... Are we resisting change, or are we so fixed on our current economic infrastructure path that we can't make dramatic changes without experiencing dramatic unintended consequences? Keep it simple stupid is simple. It's hard to screw up something simple. But in order for us to enjoy the benefits of today's massively interconnected and decidedly not simple global economic system, we cannot avoid systemic risk. It takes a pretty complex system to produce all the parts and pieces that go into our iDevices. It takes tremendously sophisticated logistical systems to get us grapes from Chile, flowers from Brazil, crayfish from China, shrimp from Vietnam and wine from all around the world. And since there is no action without reaction, no effort without consequences, no dramatic change without some kind of drama, then we must put up with and manage the growing systemic risk that comes with our complex system. The lesson to learn should be that we might start thinking a bit more simply these days. Maybe bigger isn't better. Maybe we should be working to live rather than living to work. If we consider the growing farm-to-table trend, it tells us that more and more people are looking for something a bit simpler with a bit less drama...and maybe a bit less perceived risk. It seems only natural, to seek the comfort of simple in an ever complex and confounding world. Perhaps we're nearing another dramatic change, where complicated and sophisticated have reached a point of diminishing returns, so we're turning back towards keeping it simple. Could this just be our natural cycle? Innovation drives us towards ever more complicated systems until they reach a point of inefficiency. Then we settle back into a keep it simple period, but a "new simple," one born from the "new normal" of the higher social and economic floor created by the prior period's advancements and innovations. From September 2010 to September 2011, the average weekly wage increased by 5.3%, reaching $916 by September 2011. Lake County, Ohio saw the largest wage increase in this period. In February, 29 states recorded unemployment rate decreases, 8 states posted rate increases, and 13 states and D.C. had no change. In 2010, labor productivity, defined as output per hour, rose in 83% of the 86 detailed manufacturing industries. This was up from 30% in 2009. Unit labor costs, which reflect the total labor costs required to produce a unit of output, declined in 73% of the industries in 2010, compared to only 21% in 2009, as productivity increased more rapidly than hourly compensation. All this innovation talk got us wondering just how many patents are filed annually across the world. It also got us wondering which countries are doing the most filing. 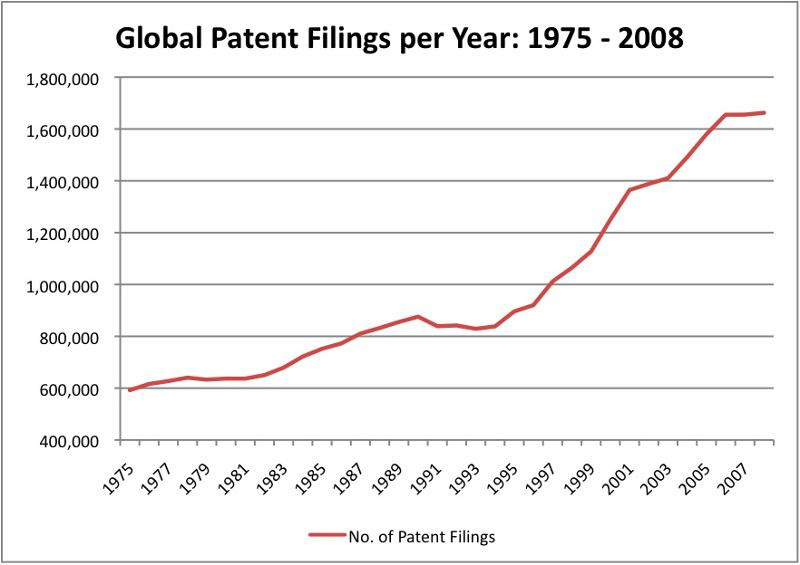 According to the World Intellectual Property Organization, global patent filings grew by 29% during the period 1983-2008 and by 85.6% between 1995 and 2008. 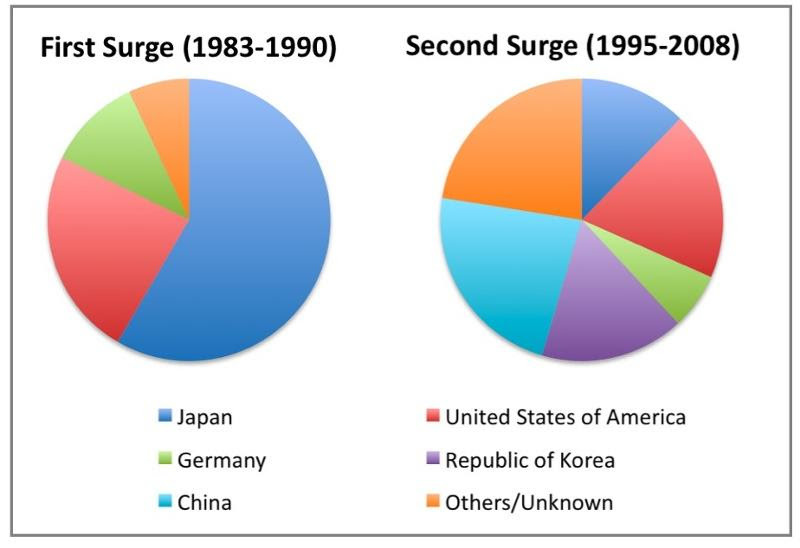 These years are divided below into Surge 1 and Surge 2. Clay Christensen, HBS professor and author of the The Innovator's Dilemma, explains the conundrum companies face when their core competence is disrupted by a disruptive innovation - either from within or from the outside. By definition, disruptive innovations transform historically expensive products into affordable and accessible products. When this happens, companies must decide if they want to change their model to cater to the new markets opened up by the disruptive innovation. But what would this mean for their higher priced products? To address this dilemma, Christensen devised a theory that allows people to find a hybrid solution. Ultimately, he argues, it's about looking not at past data, but through the lens of great theory that allows managers to find a clear future path. Christensen cites how Ford had to decide how to handle Toyota's entrance into the car industry at the lower market. Should Ford begin making smaller, more affordable cars? Or react by making even bigger SUVs? Ultimately this question is: When more affordable technologies allow for cheaper products to reach more people, should companies try to defend their lower margin products when they are also competing with higher margin products? Enter frugal innovation, so far a largely Eastern practice (of stripping the bells and whistles off Western products to create something simple, but highly affordable), but one that is poised to rock the West too. India recently introduced the Tata Nano, at $2,000, the cheapest car the world had ever seen. It was not without its problems, but the concept is getting its rightful due. What will this mean for companies that focus on more expensive products? Will they have to cannibalize their own high margin goods to compete? Encyclopaedia Britannica is stopping the presses after 244 years. Using data from its site, LinkedIn recently reported that newspapers are America's fastest shrinking industry. The printed word is certainly in duress. Print models are running on fumes, and by all accounts, the print industry would be well served to innovate or die. This innovation writer imagines a world, probably not so far off, where books come in a bundled digital pre-paid package, much like how we buy cable. Might this kind of out-of-the-book thinking save the publishing industry? A common misconception of cloud computing is that it will kill jobs. In reality, it's projected to add millions. While most will be in emerging markets, many will be in the U.S. And not just on the IT side of things. The cloud is also expected to add jobs in marketing, sales, finance and administration, production and service, thanks to cloud-generated revenue. And there's no telling what sort of innovation, entrepreneurship and jobs could eventually rain down from the cloud. Stay tuned. This article got us thinking: Nick was roughly zero-years-old when Google was launched. To Nick, Google is likely just this thing on the Internet that's always been on the Internet, which is this thing that's always been around. Because of his lack of experience, Nick probably doesn't view Google with the same wonder and respect that many of us who remember a world without Google do. When that layer of awe isn't there, anything can be demystified and viewed as something in need of improvement. Perhaps that's the secret to developing an innovative mindset, remembering that nothing is ever perfect, and nothing is ever done. Or maybe it's just knowing there are no limits to intellectual curiosity. On that note: Memo to CEOs: Stop blathering about innovation and do something. Recovery isn't just about replacing jobs lost since 2008; it's just as much about creating jobs for all those graduates who were always going to be entering the job market, recession or not. Researchers from the Hamilton Project refer to where we are and where we need to be - having enough jobs for victims of the recession and new entrants into the workforce since the recession - as the jobs gap. According to their calculations, closing the jobs gap could still be eight years away. 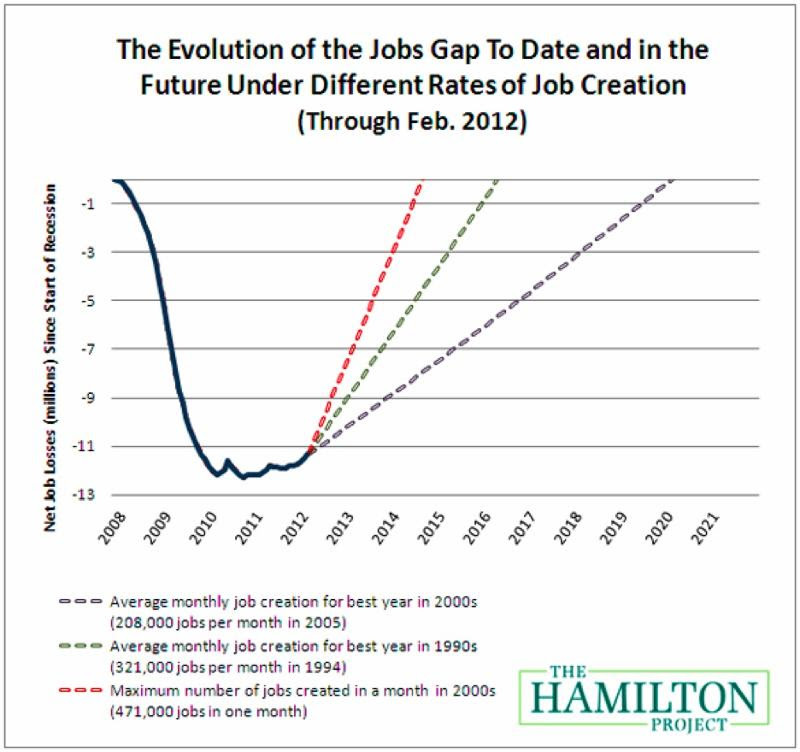 The following chart shows how long it will take our economy to close the jobs gap under three different sets of historical jobs-created rate assumptions. For the full Hamilton Project report, please follow this link. The end of cheap China: What do soaring Chinese wages mean for global manufacturing? Labor costs (wages and benefits) in China have shot up 20% a year for the past four years. According to research from consultancy firm AlixPartners, "if China's currency and shipping costs were to rise by 5% annually and wages were to go up by 30% a year, by 2015 it would be just as cheap to make things in North America as to make them in China and ship them there." So what does this mean for countries accustomed to outsourcing and consuming on the cheap from China? What does this mean for China itself? China ostensibly has a couple of decades or so left to exploit their demographic advantage. But then China will have to learn how to move up the value chain and become a nation of innovators to remain competitive. NPR liberates Texas! Curious about what an independent Texas would look like, NPR pens a hypothetical article noting what could come of a seceded Texas. Certainly a lack of regulation out of DC would likely free up many industries for rapid growth. But what of the more mundane regulations and controls that come from DC, like ensuring food safety? And what would Texas' stand be on the Israeli-Palestinian conflict? Or would it care? It's an interesting imaginary exercise. Walter Isaacson, the author of the Steve Jobs biography, addresses a common discussion that has stemmed from his book - the attempt to cull from the book what made Jobs such a phenomenal leader. To Isaacson's surprise, he recalls that Jobs once said that he considered Apple the company, not any Apple product, his most important creation. Jobs apparently felt that building an enduring company was far harder than building any iDevice. So how did he build an enduring company? Isaacson attempts to break it down by distilling Jobs' most archetypical qualities that translated into transformative leadership, like focus, putting products before profits, knowing the big picture and the details, merging humanities and sciences, among others. For all the talk we hear from leaders about the importance of innovation, how come so few companies actually know how to do it well? This innovation consultant set out to find out why, surveying 87 U.S. products and services companies to compare those deemed successful innovators with those deemed unsuccessful innovators. He found that successful innovation companies tend to share some commonalities, like having an explicit innovation strategy and innovation leader (and this is often the CEO). Read on for more best innovation practices, as well as the common mistakes of companies that fail to innovate. What makes well-paid, top employees leave? As a follow up to an earlier Forbes article listing the top 10 reasons top talent leave, this article boils it down to just one common thread: poor management that results in a confusing and uninspiring work environment. This is certainly an argument for managers to focus on a strategic vision that translates into an inspired company culture as a means to keep best employees. If great management is crucial to keeping top talent, then following these suggestions for being a remarkable boss could be useful to that end. Suggestions include develop every employee (a great vision is nothing without a great team to implement it), and always remember where you came from (the more power you have, the greater difference you can make, so be gracious with your status).